EUscreen organised its final conference on September 13 and 14, focusing on Television Heritage and the Web. We looked back on lessons learned, showcased the achievements of the project and looked at the road ahead. This conference report wraps up the conference topics and debates and was jointly edited by Brecht Declerq, Florian Delabie, Berber Hagedoorn, Yves Niederhäuser, Elke Poppe, Katja Šturm and Erwin Verbruggen. Presentations from the conference will be made available over the next days at the conference overview page. 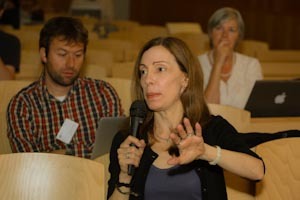 The first EUscreen conference, held in 2010, focused on selecting and contextualising historical audiovisual media through links with existing sources on the web. 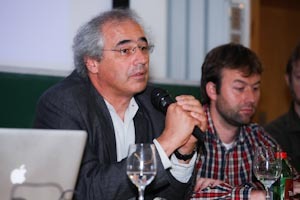 The second conference, in 2011, focused on use and creativity in the audiovisual domain. This third conference revisited these topics and further developed related ideas, based on individual contributions in the field. 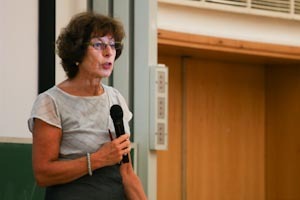 It was the final conference in multiple ways, as Prof. Dr. Sonja de Leeuw, who led both EUscreen and its predecessing project Video Active, announced that she would step down as the project leader. A celebrated television scholar, she chaired most, if not all of the previous EUscreen conferences, and opened this Budapest conference with a warm welcome and remarks on the current status of television research and the role of the EUscreen project. Keynote speaker prof. Lynn Spigel started off the conference with an outline of her upcoming book, which focuses on the visualisation of mass culture through personal archives. She researched the representation of television sets in mass-media (magazines, ads, etc.) and family snapshots. Advertisements and snapshot photographs represent very specific and individual ways of incorporating the television set as an everyday object. The images in family albums seem to document an inversion of the use of TV – instead of “watching TV”, the set becomes an accessory for personal performance instead. Throughout the ‘50 and ‘60s, people adopted televisions in many and unintended ways and used it to condense, stage and amplify the individual and the family life. On nowaday’s online platforms, snapshots of television sets with a personal, sentimental as well as a commercial value aggregate to become a shared popular culture that merges analogue nostalgia and digital culture. Wilfried Runde leads an interdisciplinary R&D-Team with 14 people at Deutsche Welle that follows and analyses trends and major changes in the media world. One of these changes is the shift from linear TV consumption to ways of media consumption that don’t depend on timely or spatial constrictions. Social media clearly play a key role in this context. The main interest for the media production industry is in the take-over of breaking news by social media platforms such as Reddit), which are faster than mainstream media could ever be. Social media changed the attitude of media consumers in that they no longer are looking for news but assume that relevant news will find their way to them. The question now for media corporations is what they can learn from these changes. Runde sees one of the answers in data-driven-journalism and sees a form of “data-tainment” emerging. In the discussion it was pointed out that data-driven journalism has to approach data as critical as it approaches other sources for journalistic research. As long as the basic methods of critical journalism are kept in place, contemporary technology allows journalists to do their work faster, working with data collections as a new source. ching to commenting, offers new possibilities that archivists could explore. In this context, Müller discussed Isto Huvila’s notion of participatory archiving of which the fundamental characteristics are “decentralised curation, radical user orientation and contextualisation of both records and the entire archival process“. As there are very engaged people documenting TV heritage out there, participatory archives could provide the platform where users become contributors to archives and archivists act as moderators and supervisors of this process. The subsequent round table concluded that many fascinating stories can be told from the archives with respect to how objects are found, researched and presented. Making this ‘implicit’ knowledge ‘explicit’ could provide a good starting point for putting participatory archiving into practice. Looking back on what has been done, drawing the lessons and building bridges to the future were the aims of the afternoon session of the first conference day. EUscreen’s seven work package leaders got the opportunity to each shed some light on the achievements of their part of the project. Vassilis Tzouvaras and his team at NTUA faced the challenge of creating interoperable solutions to the heterogeneity of metadata. It’s a nice example of a day-to-day problem in audiovisual archives that in theory has long been solved theoretically (there’s broad support for EBUcore for example), but remains tough in practice. Marco Rendina from the Luce archives in Italy reported about the conferences and workshops that spread the word on EUscreen and connected the scholarly, educational, technological and archival groups that cooperate in the project. With a record of three conferences, eight workshops and three extra workshops at the annual FIAT/IFTA conferences, EUscreen has found a wide response in the designated archive user communities. Rob Turnock from Royal Holloway discussed EUscreen’s activities on information and access. His challenge was to bring the project and all the valuable content to the web in such a way that they made sense as a whole. A well-developed content selection policy and a common metadata scheme (based on EBUcore) provided the toolbox to get the job done. The final result is a real tour de force: 40.000+ items online, two comparative exhibitions, 11 virtual exhibitions made by individual content providers and, last but not least, two editions of the open access online journal (one to appear in October). A web site is nothing without its audience. András Bálint Kovács from Eötvös Loránd University led the work package that researched and enhanced the user experience, which aimed at education, academics, reuse and the general public. András and his colleagues managed to translate the remarks of the educational sector into an easier and more attractive user interface for EUscreen. Differing IPR issues between countries and target groups remain challenging and will certainly roar their heads again in EUscreen’s successor, EUscreenXL. Pelle Snickars from Sweden’s National Library stressed the diversity of needs amongst user groups. His main challenge was to unite and target the comments of different users, coming from different perspectives. The final work package focused on disseminating the project’s results and attracting a growing audience. Erwin Verbruggen from the Netherlands Institute for Sound and Vision presented EUscreen’s activities on this level. Results were disseminated at more than 150 events and in more than 200 articles. EUscreen’s technical coordinator Johan Oomen, from Sound and Vision provided the conference audience with some future perspectives on the follow-up project, EUscreenXL, which will involve 32 partners from 22 European countries. To conclude, EUscreen’s ambitions are all but limited. The creation of an open platform for the European audiovisual heritage collections can hardly be called a walk in the park, but is a big step that connects broadcasters from different cultural and economical backgrounds all over Europe. Media creators and broadcaster’s archives are in the middle of a massive cultural and institutional shift, in which traditional restricted access is challenged and models for openness are explored. The EUscreen project provides these archives-in-transition a platform to share experiences and learn form each other what models for providing access, content and context may or may not work. The shared goal is to build and improve upon an environment that provides the best experience for those users wanting to explore the rich cultural treasure troves they each hold.